Definition at line 141 of file ModXact.h. Definition at line 54 of file ModXact.cc. References assert, debugs, HERE(), Adaptation::Icap::Xaction::icapReply, HttpReply::protoPrefix, Adaptation::Icap::InOut::setCause(), Adaptation::Icap::InOut::setHeader(), Adaptation::Icap::Xaction::status(), and virgin. Definition at line 1288 of file ModXact.cc. Definition at line 372 of file ModXact.cc. References closeChunk(), Adaptation::Icap::Preview::ieof(), openChunk(), preview, state, Adaptation::Icap::ModXact::State::writing, and Adaptation::Icap::ModXact::State::writingPreview. Definition at line 694 of file ModXact.cc. References Adaptation::Icap::Xaction::cancelRead(), debugs, disableBypass(), Adaptation::Icap::Xaction::doneWithIo(), Adaptation::Icap::Xaction::haveConnection(), HERE(), Adaptation::Icap::Xaction::isRetriable, Must, Adaptation::Icap::ServiceRep::noteFailure(), prepEchoing(), Adaptation::Icap::Xaction::reuseConnection, Adaptation::Icap::Xaction::service(), startSending(), Adaptation::Icap::Xaction::status(), stopParsing(), and stopWriting(). Definition at line 668 of file ModXact.cc. References bypassFailure(), Adaptation::Icap::Xaction::callException(), canStartBypass, debugs, detailError(), ERR_DETAIL_EXCEPTION_OTHER, ERR_DETAIL_EXCEPTION_START, HERE(), TextException::id(), AsyncJob::inCall, Adaptation::Icap::Xaction::isRetriable, and Adaptation::Icap::Xaction::status(). Definition at line 1699 of file ModXact.cc. References Adaptation::Icap::SizedEstimate::expected(), Adaptation::Icap::SizedEstimate::knownSize(), Adaptation::Icap::SizedEstimate::size(), TheBackupLimit, and virginBody. Referenced by decideOnRetries(), shouldAllow204(), and shouldAllow206out(). Referenced by bypassFailure(), Adaptation::Icap::Xaction::closeConnection(), and Adaptation::Icap::Xaction::detailError(). Definition at line 643 of file ModXact.cc. References Adaptation::Icap::InOut::body_pipe, debugs, Adaptation::Icap::ModXact::State::doneConsumingVirgin(), HERE(), state, Adaptation::Icap::Xaction::status(), BodyConsumer::stopConsumingFrom(), and virgin. Referenced by estimateVirginBody(), handle200Ok(), handle206PartialContent(), prepEchoing(), prepPartialBodyEchoing(), stopSending(), and stopWriting(). Definition at line 2009 of file ModXact.cc. Definition at line 384 of file ModXact.cc. Referenced by addLastRequestChunk(), and writeSomeBody(). Definition at line 1144 of file ModXact.cc. References bodyParser, debugs, expectHttpBody(), extensionParser, HERE(), makeAdaptedBodyPipe(), Must, Http::One::TeChunkedParser::parseExtensionValuesWith(), Adaptation::Icap::ModXact::State::parsing, Adaptation::Icap::ModXact::State::psBody, Adaptation::Icap::ModXact::State::psIcapTrailer, replyHttpBodySize, Adaptation::Icap::ModXact::State::sending, Adaptation::Icap::ModXact::State::sendingAdapted, state, stopParsing(), stopSending(), and trailerParser. Definition at line 1639 of file ModXact.cc. References debugs, Adaptation::Icap::Preview::enable(), Adaptation::Icap::Preview::enabled(), Adaptation::Icap::SizedEstimate::expected(), HERE(), Adaptation::Icap::SizedEstimate::knownSize(), min(), Must, preview, Adaptation::Icap::Config::preview_enable, Adaptation::Icap::Xaction::service(), Adaptation::Icap::SizedEstimate::size(), TheBackupLimit, Adaptation::Icap::TheConfig, virginBody, virginRequest(), and Adaptation::Icap::ServiceRep::wantsPreview(). Definition at line 1716 of file ModXact.cc. References canBackupEverything(), Adaptation::Icap::Xaction::disableRetries(), Adaptation::Icap::Preview::enabled(), Adaptation::Icap::Xaction::isRetriable, and preview. Definition at line 295 of file ModXact.cc. References debugs, HERE(), Adaptation::Icap::Preview::ieof(), Adaptation::Icap::ModXact::State::parsing, preview, Adaptation::Icap::ModXact::State::psIcapHeader, state, Adaptation::Icap::Xaction::status(), stopWriting(), Adaptation::Icap::ModXact::State::writing, and Adaptation::Icap::ModXact::State::writingPaused. Referenced by handleCommWroteHeaders(), and writePreviewBody(). Definition at line 1997 of file ModXact.cc. References HttpRequest::detailError(), ERR_ICAP_FAILURE, and request(). Referenced by callException(), noteBodyConsumerAborted(), and swanSong(). Definition at line 720 of file ModXact.cc. References canStartBypass, debugs, HERE(), and protectGroupBypass. Referenced by bypassFailure(), echoMore(), parseBody(), prepEchoing(), startSending(), virginConsume(), and waitForService(). Referenced by echoMore(), Adaptation::Icap::Launcher::launchXaction(), noteServiceReady(), parseBody(), prepEchoing(), startSending(), virginConsume(), and waitForService(). Referenced by Adaptation::Icap::Xaction::closeConnection(), decideOnRetries(), Adaptation::Icap::Launcher::launchXaction(), Adaptation::Icap::Xaction::noteCommRead(), noteServiceReady(), Adaptation::Icap::Xaction::openConnection(), and waitForService(). Definition at line 531 of file ModXact.cc. References Adaptation::Icap::Xaction::doneAll(), doneReading(), doneSending(), Adaptation::Icap::ModXact::State::doneWriting(), Adaptation::Icap::ModXact::State::serviceWaiting, and state. Definition at line 206 of file ModXact.h. Referenced by doneAll(), fillDoneStatus(), fillPendingStatus(), and readMore(). Definition at line 611 of file ModXact.cc. References Adaptation::Icap::ModXact::State::sending, Adaptation::Icap::ModXact::State::sendingDone, and state. Referenced by doneAll(), fillDoneStatus(), fillPendingStatus(), parseBody(), and stopSending(). Referenced by bypassFailure(), Adaptation::Icap::Xaction::callEnd(), Adaptation::Icap::Xaction::closeConnection(), and Adaptation::Icap::Xaction::detailError(). Definition at line 207 of file ModXact.h. References buf, head, and request(). Definition at line 578 of file ModXact.cc. References Adaptation::Icap::VirginBodyAct::active(), adapted, Adaptation::Icap::InOut::body_pipe, BodyPipe::buf(), MemBuf::contentSize(), debugs, disableBypass(), Adaptation::Icap::Xaction::disableRepeats(), HERE(), Must, NULL, Adaptation::Icap::VirginBodyAct::progress(), BodyPipe::putMoreData(), Adaptation::Icap::ModXact::State::sending, Adaptation::Icap::ModXact::State::sendingVirgin, size, state, Adaptation::Icap::Xaction::status(), BodyPipe::status(), stopSending(), virgin, virginBodyEndReached(), virginBodySending, virginConsume(), virginContentData(), and virginContentSize(). Referenced by noteBodyProducerAborted(), noteBodyProductionEnded(), noteMoreBodyDataAvailable(), noteMoreBodySpaceAvailable(), prepPartialBodyEchoing(), and startSending(). Definition at line 1593 of file ModXact.cc. References HttpHeader::addEntry(), Packable::appendf(), MemBuf::contentSize(), HttpHeader::delById(), HttpHeader::getEntry(), RefCount< C >::getRaw(), Http::Message::header, Http::Message::http_ver, HttpHeaderInitPos, Http::Message::inheritProperties(), HttpRequest::method, Must, packHead(), Http::PROXY_AUTHENTICATE, HttpHeader::removeHopByHopEntries(), HttpReply::sline, and HttpRequest::url. Definition at line 1824 of file ModXact.cc. References Adaptation::Icap::InOut::body_pipe, Http::Message::body_pipe, BodyPipe::buf(), Adaptation::Icap::InOut::cause, checkConsuming(), debugs, Adaptation::Icap::SizedEstimate::expect(), Http::Message::expectingBody(), Adaptation::Icap::InOut::header, HERE(), MemBuf::max_capacity, method, HttpRequest::method, Http::METHOD_NONE, Must, NULL, Adaptation::Icap::VirginBodyAct::plan(), BodyPipe::setConsumerIfNotLate(), size, TheBackupLimit, virgin, virginBody, and virginBodyWriting. Definition at line 1126 of file ModXact.cc. Definition at line 1121 of file ModXact.cc. Referenced by parseHttpHead(), and validate200Ok(). Definition at line 1131 of file ModXact.cc. References Http::ALLOW, DBG_IMPORTANT, debugs, HttpHeader::getByIdIfPresent(), HttpHeader::hasListMember(), Http::Message::header, Adaptation::Icap::Xaction::icapReply, Must, String::size(), and Http::TRAILER. Definition at line 1790 of file ModXact.cc. References MemBuf::append(), Packable::appendf(), Adaptation::Icap::InOut::body_pipe, Adaptation::Icap::Preview::done(), Adaptation::Icap::ModXact::State::doneParsing(), doneReading(), doneSending(), Adaptation::Icap::ModXact::State::doneWriting(), Adaptation::Icap::Preview::enabled(), Adaptation::Icap::Xaction::fillDoneStatus(), Adaptation::Icap::Preview::ieof(), preview, state, and virgin. Definition at line 1750 of file ModXact.cc. 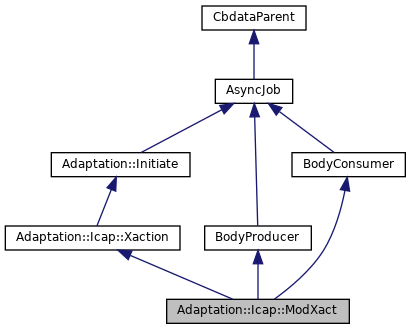 References Adaptation::Icap::VirginBodyAct::active(), MemBuf::append(), Packable::appendf(), Adaptation::Icap::InOut::body_pipe, canStartBypass, Adaptation::Icap::Preview::debt(), Adaptation::Icap::Preview::done(), Adaptation::Icap::ModXact::State::doneParsing(), doneReading(), doneSending(), Adaptation::Icap::ModXact::State::doneWriting(), Adaptation::Icap::Preview::enabled(), Adaptation::Icap::Xaction::fillPendingStatus(), Adaptation::Icap::Xaction::haveConnection(), NULL, Adaptation::Icap::ModXact::State::parsing, preview, protectGroupBypass, Adaptation::Icap::ModXact::State::psIcapHeader, Adaptation::Icap::ModXact::State::readyForUob, Adaptation::Icap::ModXact::State::sending, Adaptation::Icap::ModXact::State::sendingUndecided, Adaptation::Icap::ModXact::State::serviceWaiting, state, virgin, virginBodySending, Adaptation::Icap::ModXact::State::writing, and Adaptation::Icap::ModXact::State::writingInit. Definition at line 1987 of file ModXact.cc. Definition at line 1315 of file ModXact.cc. References adapted, AccessLogEntry::adapted_request, Adaptation::Icap::Xaction::al, Adaptation::Icap::Xaction::alep, assert, Http::Message::body_pipe, AccessLogEntry::IcapLogEntry::bodyBytesRead, MemBuf::buf, AccessLogEntry::cache, AccessLogEntry::CacheDetails::caddr, Adaptation::Icap::InOut::cause, Adaptation::Service::cfg(), MemBuf::clean(), HttpRequest::client_addr, AccessLogEntry::HttpDetails::clientReplySz, AccessLogEntry::HttpDetails::clientRequestSz, AccessLogEntry::HttpDetails::code, AccessLogEntry::CacheDetails::code, HttpReply::content_type, AccessLogEntry::HttpDetails::content_type, Adaptation::Icap::Xaction::finalizeLogInfo(), Http::Message::hdr_sz, MessageSizes::header, Adaptation::Icap::InOut::header, Http::Message::header, AccessLogEntry::headers, AccessLogEntry::CacheDetails::highOffset, AccessLogEntry::http, HTTPMSGLOCK(), AccessLogEntry::icap, HttpRequest::icapHistory(), AccessLogEntry::icp, ICP_INVALID, MemBuf::init(), max(), Adaptation::ServiceConfig::method, Must, NULL, AccessLogEntry::IcpDetails::opcode, HttpHeader::packInto(), MessageSizes::payloadData, prepareLogWithRequestDetails(), BodyPipe::producedSize(), AccessLogEntry::Headers::reply, AccessLogEntry::reply, replyHttpBodySize, replyHttpHeaderSize, AccessLogEntry::IcapLogEntry::reqMethod, AccessLogEntry::request, AccessLogEntry::CacheDetails::rfc931, Adaptation::Icap::Xaction::service(), HttpReply::sline, AccessLogEntry::CacheDetails::ssluser, Http::StatusLine::status(), String::termedBuf(), AccessLogEntry::url, virgin, virginRequest(), xstrdup, and zero. Definition at line 1736 of file ModXact.cc. References Adaptation::Icap::VirginBodyAct::active(), Adaptation::Icap::Preview::ad(), Adaptation::Icap::InOut::body_pipe, Adaptation::Icap::Preview::done(), Adaptation::Icap::Preview::ieof(), Must, preview, virgin, virginBodyWriting, and Adaptation::Icap::Preview::wrote(). Definition at line 1815 of file ModXact.cc. References HttpHeader::getByNameListMember(), Http::Message::header, Adaptation::Icap::Xaction::icapReply, and SBuf::isEmpty(). Referenced by expectHttpBody(), expectHttpHeader(), maybeAllocateHttpMsg(), and validate200Ok(). Definition at line 899 of file ModXact.cc. References Adaptation::Icap::ModXact::State::allowedPostview204, Adaptation::Icap::ModXact::State::allowedPostview206, Adaptation::Icap::Preview::done(), Adaptation::Icap::Preview::enabled(), Adaptation::Icap::Xaction::icapReply, Adaptation::Icap::Preview::ieof(), Must, Adaptation::Icap::ModXact::State::parsing, preview, Adaptation::Icap::ModXact::State::psIcapHeader, HttpReply::reset(), state, stopBackup(), writeMore(), Adaptation::Icap::ModXact::State::writing, Adaptation::Icap::ModXact::State::writingPaused, and Adaptation::Icap::ModXact::State::writingPrime. Definition at line 918 of file ModXact.cc. References checkConsuming(), Adaptation::Icap::ModXact::State::parsing, Adaptation::Icap::ModXact::State::psHttpHeader, Adaptation::Icap::ModXact::State::sending, Adaptation::Icap::ModXact::State::sendingAdapted, state, and stopBackup(). Definition at line 926 of file ModXact.cc. Definition at line 932 of file ModXact.cc. References Adaptation::Icap::ModXact::State::allowedPostview206, Adaptation::Icap::ModXact::State::allowedPreview206, checkConsuming(), debugs, Adaptation::Icap::Preview::enabled(), HERE(), Must, Adaptation::Icap::ModXact::State::parsing, preview, Adaptation::Icap::ModXact::State::psHttpHeader, Adaptation::Icap::ModXact::State::readyForUob, Adaptation::Icap::ModXact::State::sending, Adaptation::Icap::ModXact::State::sendingAdapted, state, Adaptation::Icap::ModXact::State::writing, and Adaptation::Icap::ModXact::State::writingPaused. Definition at line 190 of file ModXact.cc. References MemBuf::content(), current_time, debugs, HERE(), Adaptation::Icap::Xaction::icap_tio_start, MemBuf::init(), makeRequestHeaders(), Must, Adaptation::Icap::Xaction::scheduleWrite(), startReading(), state, Adaptation::Icap::Xaction::status(), MemBuf::terminate(), Adaptation::Icap::ModXact::State::writing, Adaptation::Icap::ModXact::State::writingConnect, and Adaptation::Icap::ModXact::State::writingHeaders. Definition at line 570 of file ModXact.cc. References current_time, Adaptation::Icap::ModXact::State::doneParsing(), Adaptation::Icap::Xaction::icap_tio_finish, Must, parseMore(), readMore(), and state. Definition at line 209 of file ModXact.cc. References debugs, handleCommWroteBody(), handleCommWroteHeaders(), HERE(), state, Adaptation::Icap::ModXact::State::writing, and Adaptation::Icap::ModXact::State::writingHeaders. Definition at line 481 of file ModXact.cc. Definition at line 219 of file ModXact.cc. References decideWritingAfterPreview(), Adaptation::Icap::Preview::done(), Adaptation::Icap::Preview::enabled(), Adaptation::Icap::SizedEstimate::expected(), Must, preview, state, stopWriting(), virginBody, writeMore(), Adaptation::Icap::ModXact::State::writing, Adaptation::Icap::ModXact::State::writingHeaders, Adaptation::Icap::ModXact::State::writingPreview, and Adaptation::Icap::ModXact::State::writingPrime. Definition at line 1054 of file ModXact.cc. References stopBackup(), stopParsing(), and TexcHere. Referenced by bypassFailure(), Adaptation::Icap::Xaction::cancelRead(), Adaptation::Icap::Xaction::closeConnection(), Adaptation::Icap::Xaction::detailError(), Adaptation::Icap::Xaction::doneWithIo(), Adaptation::Icap::Xaction::fillDoneStatus(), Adaptation::Icap::Xaction::fillPendingStatus(), fillPendingStatus(), Adaptation::Icap::Xaction::handleCommTimedout(), Adaptation::Icap::Xaction::openConnection(), Adaptation::Icap::Xaction::scheduleRead(), Adaptation::Icap::Xaction::scheduleWrite(), startReading(), and Adaptation::Icap::Xaction::updateTimeout(). Definition at line 1864 of file ModXact.cc. References adapted, Adaptation::Icap::InOut::body_pipe, Http::Message::body_pipe, debugs, Adaptation::Icap::InOut::header, HERE(), and Must. Referenced by decideOnParsingBody(), and prepEchoing(). Definition at line 1531 of file ModXact.cc. References Adaptation::Icap::ModXact::State::allowedPostview204, Adaptation::Icap::ModXact::State::allowedPostview206, Adaptation::Icap::ModXact::State::allowedPreview206, Packable::appendf(), debugs, Adaptation::Icap::Preview::enabled(), Adaptation::Icap::SizedEstimate::expected(), Adaptation::Icap::VirginBodyAct::plan(), preview, shouldAllow204(), shouldAllow206in(), shouldAllow206out(), state, virginBody, and virginBodySending. Definition at line 1391 of file ModXact.cc. References Adaptation::Icap::Preview::ad(), HttpRequest::adaptHistory(), NotePairs::add(), alMaster, MemBuf::append(), Packable::appendf(), base64_encode_final(), base64_encode_init(), base64_encode_len, base64_encode_update(), Adaptation::Icap::InOut::cause, Adaptation::Service::cfg(), MemBuf::clean(), HttpRequest::client_addr, MemBuf::content(), MemBuf::contentSize(), crlf, Adaptation::Icap::Preview::enabled(), encapsulateHead(), Adaptation::Icap::SizedEstimate::expected(), HttpRequest::extacl_passwd, HttpRequest::extacl_user, finishNullOrEmptyBodyPreview(), HttpHeader::getById(), Adaptation::History::getXxRecord(), HttpHeader::has(), NotePairs::hasPair(), Adaptation::Icap::InOut::header, Http::Message::header, Adaptation::ServiceConfig::host, Adaptation::Icap::Xaction::icapRequest, HttpRequest::indirect_client_addr, MemBuf::init(), Ip::Address::isAnyAddr(), Ip::Address::isNoAddr(), SBuf::length(), makeAllowHeader(), makeUsernameHeader(), Adaptation::Config::masterx_shared_name, MAX_IPSTRLEN, MAX_LOGIN_SZ, Adaptation::Config::metaHeaders, Adaptation::History::metaHeaders, Adaptation::ServiceConfig::method, Adaptation::methodReqmod, Adaptation::methodRespmod, Adaptation::ServiceConfig::methodStr(), mkrfc1123(), Must, NULL, Http::Message::parseCharBuf(), Adaptation::ServiceConfig::port, preview, Http::PROXY_AUTHENTICATE, Http::PROXY_AUTHORIZATION, String::rawBuf(), SBuf::rawContent(), request(), Adaptation::Icap::Config::reuse_connections, Adaptation::Config::send_client_ip, Adaptation::Config::send_username, Adaptation::Icap::Xaction::service(), String::size(), squid_curtime, SQUIDSTRINGPH, SQUIDSTRINGPRINT, Adaptation::Icap::TheConfig, Ip::Address::toStr(), Adaptation::ServiceConfig::uri, Adaptation::Config::use_indirect_client, virgin, virginBody, and virginRequest(). Definition at line 1567 of file ModXact.cc. References Packable::appendf(), HttpRequest::auth_user_request, base64_encode_final(), base64_encode_init(), base64_encode_len, base64_encode_update(), Adaptation::Icap::Config::client_username_encode, Adaptation::Icap::Config::client_username_header, HttpRequest::extacl_user, MAX_LOGIN_SZ, NULL, String::size(), String::termedBuf(), Adaptation::Icap::TheConfig, and Auth::UserRequest::username(). Definition at line 181 of file ModXact.h. Definition at line 733 of file ModXact.cc. References adapted, gotEncapsulated(), Adaptation::Icap::InOut::header, method, Adaptation::methodReqmod, Adaptation::Icap::Xaction::service(), Adaptation::Icap::InOut::setHeader(), Adaptation::Icap::Xaction::setOutcome(), TexcHere, virginRequest(), Adaptation::Icap::xoModified, and Adaptation::Icap::xoSatisfied. Referenced by Adaptation::Icap::Xaction::detailError(), parseBody(), parseHeaders(), and Adaptation::Icap::Xaction::parseHttpMsg(). Referenced by HttpStateData::abortAll(), Ftp::Client::abortAll(), Comm::TcpAcceptor::acceptOne(), Adaptation::Ecap::XactionRep::adaptationAborted(), Adaptation::AccessCheck::callBack(), AsyncJob::callException(), Security::PeerConnector::connectionClosed(), HttpStateData::continueAfterParsingHeader(), Ftp::Client::ctrlClosed(), Adaptation::Iterator::handleAdaptationBlock(), Adaptation::Iterator::handleAdaptationError(), Log::TcpLogger::handleClosure(), Adaptation::Icap::Xaction::handleCommClosed(), Http::Tunneler::handleConnectionClosure(), Mgr::Forwarder::handleError(), Ipc::Forwarder::handleError(), Ipc::Forwarder::handleException(), Ipc::Inquirer::handleException(), HttpStateData::handleMoreRequestBodyAvailable(), Ipc::Inquirer::handleRemoteAck(), Ipc::Forwarder::handleTimeout(), HttpStateData::httpStateConnClosed(), HttpStateData::httpTimeout(), Comm::ConnOpener::noteAbort(), noteBodyConsumerAborted(), Snmp::Forwarder::noteCommClosed(), Snmp::Inquirer::noteCommClosed(), Mgr::Inquirer::noteCommClosed(), Mgr::Forwarder::noteCommClosed(), Mgr::StoreToCommWriter::noteCommClosed(), Adaptation::Icap::Xaction::noteCommRead(), Rock::HeaderUpdater::noteDoneReading(), Adaptation::Iterator::noteInitiatorAborted(), Adaptation::Icap::Xaction::noteInitiatorAborted(), Adaptation::Ecap::XactionRep::noteInitiatorAborted(), HttpStateData::readReply(), Comm::ConnOpener::sendAnswer(), Rock::Rebuild::start(), Security::PeerConnector::start(), HttpStateData::start(), Ipc::UdsSender::timedout(), and HttpStateData::wroteLast(). Definition at line 1282 of file ModXact.cc. References detailError(), ERR_DETAIL_ICAP_XACT_BODY_CONSUMER_ABORT, and AsyncJob::mustStop(). Definition at line 1258 of file ModXact.cc. References Adaptation::Icap::InOut::body_pipe, echoMore(), Must, BodyPipe::productionEnded(), Adaptation::Icap::ModXact::State::sending, Adaptation::Icap::ModXact::State::sendingVirgin, state, virgin, and writeMore(). Definition at line 1245 of file ModXact.cc. Definition at line 1236 of file ModXact.cc. References echoMore(), Adaptation::Icap::ModXact::State::sending, Adaptation::Icap::ModXact::State::sendingVirgin, state, and writeMore(). Definition at line 1271 of file ModXact.cc. References echoMore(), Must, parseMore(), Adaptation::Icap::ModXact::State::sending, Adaptation::Icap::ModXact::State::sendingAdapted, Adaptation::Icap::ModXact::State::sendingUndecided, Adaptation::Icap::ModXact::State::sendingVirgin, and state. Definition at line 168 of file ModXact.cc. References Must, Adaptation::Icap::Xaction::service(), Adaptation::Icap::ModXact::State::serviceWaiting, startWriting(), state, and waitForService(). Definition at line 151 of file ModXact.cc. References Adaptation::Icap::Xaction::disableRepeats(), Adaptation::Icap::Xaction::disableRetries(), Must, Adaptation::Icap::Xaction::service(), Adaptation::Icap::ModXact::State::serviceWaiting, startWriting(), state, TexcHere, and waitForService(). Definition at line 379 of file ModXact.cc. Referenced by Adaptation::Icap::Xaction::detailError(), Adaptation::Icap::OptXact::start(), and startWriting(). Definition at line 1633 of file ModXact.cc. Referenced by encapsulateHead(), and prepEchoing(). Definition at line 1164 of file ModXact.cc. References adapted, Adaptation::Icap::InOut::body_pipe, bodyParser, BodyPipe::buf(), MemBuf::contentSize(), debugs, disableBypass(), Adaptation::Icap::Xaction::disableRepeats(), doneSending(), extensionParser, HERE(), SBuf::length(), Adaptation::Icap::Xaction::mayReadMore(), Must, Http::One::Parser::needsMoreData(), Http::One::TeChunkedParser::needsMoreSpace(), Http::One::TeChunkedParser::parse(), Adaptation::Icap::ModXact::State::parsing, prepPartialBodyEchoing(), Adaptation::Icap::ModXact::State::psBody, Adaptation::Icap::ModXact::State::psIcapTrailer, Adaptation::Icap::Xaction::readBuf, readMore(), Adaptation::Icap::ModXact::State::readyForUob, Http::One::Parser::remaining(), replyHttpBodySize, Adaptation::Icap::ChunkExtensionValueParser::sawUseOriginalBody(), Http::One::TeChunkedParser::setPayloadBuffer(), state, stopParsing(), stopSending(), trailerParser, and Adaptation::Icap::ChunkExtensionValueParser::useOriginalBody(). Definition at line 1112 of file ModXact.cc. Referenced by parseHttpHead(), and parseIcapHead(). Definition at line 749 of file ModXact.cc. References debugs, HERE(), Adaptation::Icap::Xaction::mayReadMore(), Must, parseHttpHead(), parseIcapHead(), Adaptation::Icap::ModXact::State::parsing, Adaptation::Icap::ModXact::State::parsingHeaders(), Adaptation::Icap::ModXact::State::psHttpHeader, Adaptation::Icap::ModXact::State::psIcapHeader, startSending(), and state. Definition at line 1064 of file ModXact.cc. References adapted, decideOnParsingBody(), expectHttpHeader(), Http::Message::hdr_sz, Adaptation::Icap::InOut::header, Http::Message::inheritProperties(), maybeAllocateHttpMsg(), Must, parseHead(), replyHttpHeaderSize, and virgin. Referenced by Adaptation::Icap::Xaction::detailError(), and Adaptation::Icap::OptXact::parseResponse(). Definition at line 792 of file ModXact.cc. References adapted, HttpRequest::adaptHistory(), HttpRequest::adaptLogHistory(), debugs, expectIcapTrailers(), HttpHeader::getByName(), HttpHeader::getList(), RefCount< C >::getRaw(), handle100Continue(), handle200Ok(), handle204NoContent(), handle206PartialContent(), handleUnknownScode(), Adaptation::Icap::InOut::header, Http::Message::header, HERE(), httpHeaderHasConnDir(), Adaptation::Icap::Xaction::icapReply, Adaptation::Config::masterx_shared_name, Must, NULL, parseHead(), Adaptation::History::recordMeta(), request(), Adaptation::Icap::Xaction::reuseConnection, Http::scContinue, Http::scCreated, Http::scNoContent, Http::scOkay, Http::scPartialContent, Adaptation::Icap::ModXact::State::sending, Adaptation::Icap::ModXact::State::sendingUndecided, Adaptation::Icap::Xaction::service(), String::size(), HttpReply::sline, state, Http::StatusLine::status(), stopWriting(), TexcHere, trailerParser, Adaptation::History::updateNextServices(), Adaptation::History::updateXxRecord(), validate200Ok(), virginRequest(), Adaptation::Icap::ModXact::State::writing, Adaptation::Icap::ModXact::State::writingPaused, and Http::X_NEXT_SERVICES. Parses ICAP trailers and stops parsing, if all trailer data have been received. Definition at line 881 of file ModXact.cc. References debugs, HttpHeader::entries, parsePart(), stopParsing(), Adaptation::Icap::TrailerParser::trailer, and trailerParser. Definition at line 653 of file ModXact.cc. References debugs, SBuf::length(), parseBody(), parseHeaders(), parseIcapTrailer(), Adaptation::Icap::ModXact::State::parsing, Adaptation::Icap::ModXact::State::parsingHeaders(), Adaptation::Icap::ModXact::State::psBody, Adaptation::Icap::ModXact::State::psIcapTrailer, Adaptation::Icap::Xaction::readBuf, state, and Adaptation::Icap::Xaction::status(). Referenced by handleCommRead(), and noteMoreBodySpaceAvailable(). Definition at line 1094 of file ModXact.cc. References SBuf::c_str(), Adaptation::Icap::Xaction::commEof, SBuf::consume(), debugs, error(), SBuf::length(), Must, Adaptation::Icap::ModXact::State::parsing, Adaptation::Icap::Xaction::readBuf, Http::scNone, and state. Referenced by parseHead(), and parseIcapTrailer(). Definition at line 952 of file ModXact.cc. References Adaptation::Icap::VirginBodyAct::active(), adapted, Adaptation::Icap::InOut::body_pipe, Http::Message::body_pipe, BodyPipe::bodySize(), BodyPipe::bodySizeKnown(), checkConsuming(), MemBuf::clean(), MemBuf::content(), MemBuf::contentSize(), debugs, disableBypass(), Adaptation::Icap::Xaction::disableRepeats(), error(), RefCount< C >::getRaw(), Http::Message::hdr_sz, Adaptation::Icap::InOut::header, HERE(), Http::Message::inheritProperties(), MemBuf::init(), makeAdaptedBodyPipe(), Must, NULL, packHead(), Http::Message::parse(), Adaptation::Icap::VirginBodyAct::plan(), Http::scNone, Adaptation::Icap::ModXact::State::sending, Adaptation::Icap::ModXact::State::sendingVirgin, BodyPipe::setBodySize(), Adaptation::Icap::InOut::setHeader(), Adaptation::Icap::Xaction::setOutcome(), state, stopSending(), MemBuf::terminate(), virgin, virginBodySending, and Adaptation::Icap::xoEcho. Referenced by bypassFailure(), and handle204NoContent(). Called when we received use-original-body chunk extension in 206 response. We actually start sending (echoing or not) in startSending(). Definition at line 1025 of file ModXact.cc. References Adaptation::Icap::VirginBodyAct::active(), adapted, Adaptation::Icap::InOut::body_pipe, Http::Message::body_pipe, BodyPipe::bodySize(), BodyPipe::bodySizeKnown(), BodyPipe::buf(), checkConsuming(), MemBuf::contentSize(), debugs, echoMore(), BodyPipe::expectProductionEndAfter(), Adaptation::Icap::InOut::header, HERE(), Must, NULL, Adaptation::Icap::VirginBodyAct::progress(), Adaptation::Icap::ModXact::State::sending, Adaptation::Icap::ModXact::State::sendingVirgin, Adaptation::Icap::Xaction::setOutcome(), state, virgin, virginBodySending, virginConsumed, and Adaptation::Icap::xoPartEcho. Definition at line 549 of file ModXact.cc. References adapted, Adaptation::Icap::InOut::body_pipe, BodyPipe::buf(), debugs, doneReading(), MemBuf::hasPotentialSpace(), HERE(), SBuf::length(), NULL, Adaptation::Icap::Xaction::readBuf, Adaptation::Icap::Xaction::reader, and Adaptation::Icap::Xaction::scheduleRead(). Referenced by handleCommRead(), parseBody(), and startReading(). Referenced by Adaptation::Icap::Xaction::detailError(), Adaptation::Icap::OptXact::handleCommConnected(), Adaptation::Icap::OptXact::handleCommRead(), Adaptation::Icap::Xaction::noteCommRead(), and readMore(). Referenced by Adaptation::Icap::Xaction::detailError(), Adaptation::Icap::OptXact::handleCommConnected(), handleCommConnected(), and writeSomeBody(). Referenced by Adaptation::Ecap::XactionRep::blockVirgin(), Adaptation::Iterator::handleAdaptationBlock(), Adaptation::Iterator::handleAdaptationError(), Adaptation::Icap::OptXact::handleCommRead(), Adaptation::Icap::Launcher::noteAdaptationAnswer(), startSending(), Adaptation::Iterator::step(), Adaptation::Initiate::tellQueryAborted(), Adaptation::Ecap::XactionRep::useAdapted(), and Adaptation::Ecap::XactionRep::useVirgin(). Referenced by bypassFailure(), Adaptation::Icap::Xaction::callException(), Adaptation::Icap::Xaction::clearError(), Adaptation::Icap::Xaction::closeConnection(), Adaptation::Icap::ConnWaiterDialer::ConnWaiterDialer(), decideOnPreview(), Adaptation::Icap::Xaction::dieOnConnectionFailure(), Adaptation::Icap::Xaction::dnsLookupDone(), Adaptation::Icap::Xaction::finalizeLogInfo(), finalizeLogInfo(), Adaptation::Icap::Xaction::handleSecuredPeer(), Adaptation::Icap::OptXact::makeRequest(), makeRequestHeaders(), maybeAllocateHttpMsg(), Adaptation::Icap::Xaction::noteCommConnected(), noteServiceAvailable(), noteServiceReady(), Adaptation::Icap::Xaction::openConnection(), parseIcapHead(), shouldAllow204(), shouldAllow206any(), start(), Adaptation::Icap::Xaction::swanSong(), Adaptation::Icap::Xaction::updateTimeout(), validate200Ok(), and waitForService(). Referenced by Adaptation::Icap::Xaction::callException(), Adaptation::Icap::Xaction::clearError(), Adaptation::Icap::OptXact::handleCommRead(), maybeAllocateHttpMsg(), Adaptation::Icap::Xaction::noteCommRead(), Adaptation::Icap::Xaction::noteInitiatorAborted(), prepEchoing(), and prepPartialBodyEchoing(). Definition at line 1671 of file ModXact.cc. Definition at line 1680 of file ModXact.cc. References Adaptation::Icap::Config::allow206_enable, Adaptation::Icap::ServiceRep::allows206(), Adaptation::Icap::SizedEstimate::expected(), Adaptation::Icap::Xaction::service(), Adaptation::Icap::TheConfig, and virginBody. Referenced by shouldAllow206in(), and shouldAllow206out(). Definition at line 1687 of file ModXact.cc. References Adaptation::Icap::Preview::enabled(), preview, and shouldAllow206any(). Definition at line 1693 of file ModXact.cc. Definition at line 88 of file ModXact.cc. References adaptHistoryId, HttpRequest::adaptLogHistory(), Adaptation::Icap::Xaction::attempts, Adaptation::ServiceConfig::bypass, canStartBypass, Adaptation::Service::cfg(), estimateVirginBody(), Adaptation::Icap::Xaction::icap_tr_start, NULL, Adaptation::History::recordXactStart(), Adaptation::Icap::Xaction::service(), Adaptation::Icap::Xaction::start(), startWriting(), virginRequest(), and waitForService(). Definition at line 538 of file ModXact.cc. References adapted, Adaptation::Icap::InOut::body_pipe, Adaptation::Icap::Xaction::haveConnection(), Adaptation::Icap::InOut::header, Must, Adaptation::Icap::Xaction::reader, and readMore(). Definition at line 772 of file ModXact.cc. References adapted, disableBypass(), Adaptation::Icap::Xaction::disableRepeats(), echoMore(), Adaptation::Answer::Forward(), Adaptation::Icap::InOut::header, Adaptation::Initiate::sendAnswer(), Adaptation::Icap::ModXact::State::sending, Adaptation::Icap::ModXact::State::sendingVirgin, state, and updateSources(). Referenced by bypassFailure(), and parseHeaders(). Definition at line 179 of file ModXact.cc. References decideOnPreview(), decideOnRetries(), Adaptation::Icap::Xaction::openConnection(), state, Adaptation::Icap::ModXact::State::writing, and Adaptation::Icap::ModXact::State::writingConnect. Referenced by noteServiceAvailable(), noteServiceReady(), and start(). Referenced by bypassFailure(), Adaptation::Icap::Xaction::callEnd(), callException(), checkConsuming(), Adaptation::Icap::Xaction::closeConnection(), decideWritingAfterPreview(), Adaptation::Icap::Xaction::detailError(), Adaptation::Icap::Xaction::disableRepeats(), Adaptation::Icap::Xaction::disableRetries(), echoMore(), Adaptation::Icap::OptXact::handleCommConnected(), handleCommConnected(), Adaptation::Icap::Xaction::handleCommTimedout(), Adaptation::Icap::OptXact::handleCommWrote(), ModXact(), parseMore(), Adaptation::Icap::OptXact::parseResponse(), stopBackup(), stopParsing(), stopSending(), stopWriting(), swanSong(), waitForService(), writeMore(), and writePreviewBody(). Definition at line 521 of file ModXact.cc. References Adaptation::Icap::VirginBodyAct::active(), debugs, Adaptation::Icap::VirginBodyAct::disable(), HERE(), Adaptation::Icap::Xaction::status(), virginBodySending, and virginConsume(). Referenced by handle100Continue(), handle200Ok(), and handleUnknownScode(). Referenced by Ftp::Relay::abortOnData(), checkConsuming(), Client::cleanAdaptation(), Client::doneSendingRequestBody(), Client::endAdaptedBodyConsumption(), ClientHttpRequest::endRequestSatisfaction(), Adaptation::Ecap::XactionRep::forgetVb(), Client::handleAdaptedBodyProducerAborted(), Client::handleRequestBodyProducerAborted(), BodySink::noteBodyProducerAborted(), ClientHttpRequest::noteBodyProducerAborted(), BodySink::noteBodyProductionEnded(), Client::serverComplete(), Client::swanSong(), Adaptation::Ecap::XactionRep::swanSong(), and ClientHttpRequest::~ClientHttpRequest(). Definition at line 1216 of file ModXact.cc. References bodyParser, debugs, SBuf::isEmpty(), Must, Adaptation::Icap::ModXact::State::parsing, Adaptation::Icap::ModXact::State::psDone, Adaptation::Icap::Xaction::readBuf, state, Adaptation::Icap::Xaction::status(), and trailerParser. Referenced by bypassFailure(), decideOnParsingBody(), handle204NoContent(), handleUnknownScode(), parseBody(), and parseIcapTrailer(). Referenced by Client::cleanAdaptation(), ConnStateData::finishDechunkingRequest(), Adaptation::Ecap::XactionRep::moveAbContent(), Adaptation::Ecap::XactionRep::noteBodyConsumerAborted(), Client::noteBodyConsumerAborted(), Client::serverComplete2(), stopSending(), Adaptation::Ecap::XactionRep::swanSong(), and BodyProducer::~BodyProducer(). Definition at line 617 of file ModXact.cc. References adapted, Adaptation::Icap::InOut::body_pipe, checkConsuming(), debugs, Adaptation::Icap::VirginBodyAct::disable(), doneSending(), HERE(), Must, BodyPipe::needsMoreData(), NULL, Adaptation::Icap::ModXact::State::sending, Adaptation::Icap::ModXact::State::sendingDone, Adaptation::Icap::ModXact::State::sendingUndecided, state, Adaptation::Icap::Xaction::status(), BodyProducer::stopProducingFor(), and virginBodySending. Referenced by decideOnParsingBody(), echoMore(), parseBody(), prepEchoing(), and swanSong(). Definition at line 489 of file ModXact.cc. References Adaptation::Icap::VirginBodyAct::active(), checkConsuming(), debugs, Adaptation::Icap::VirginBodyAct::disable(), HERE(), Adaptation::Icap::Xaction::ignoreLastWrite, NULL, Adaptation::Icap::Xaction::reuseConnection, state, Adaptation::Icap::Xaction::status(), virginBodyWriting, virginConsume(), Adaptation::Icap::Xaction::writer, Adaptation::Icap::ModXact::State::writing, Adaptation::Icap::ModXact::State::writingAlmostDone, and Adaptation::Icap::ModXact::State::writingReallyDone. Referenced by bypassFailure(), decideWritingAfterPreview(), handleCommWroteHeaders(), parseIcapHead(), swanSong(), writeMore(), and writePrimeBody(). Definition at line 1295 of file ModXact.cc. References adaptHistoryId, HttpRequest::adaptLogHistory(), debugs, detailError(), ERR_DETAIL_ICAP_XACT_OTHER, HERE(), NULL, prepareLogWithRequestDetails(), Adaptation::History::recordXactFinish(), CbcPointer< Cbc >::set(), Adaptation::Icap::Xaction::status(), stopSending(), stopWriting(), Adaptation::Icap::Xaction::swanSong(), Adaptation::Initiate::theInitiator, and virginRequest(). Definition at line 2020 of file ModXact.cc. References Must, Http::Message::srcIcap, and Http::Message::srcIcaps. Definition at line 890 of file ModXact.cc. References Adaptation::Service::cfg(), expectHttpHeader(), gotEncapsulated(), Adaptation::ServiceConfig::method, method, Adaptation::methodReqmod, Adaptation::methodRespmod, and Adaptation::Icap::Xaction::service(). Definition at line 398 of file ModXact.cc. References Adaptation::Icap::VirginBodyAct::active(), Adaptation::Icap::InOut::body_pipe, BodyPipe::expectMoreAfter(), Adaptation::Icap::VirginBodyAct::offset(), and virgin. Referenced by echoMore(), writePrimeBody(), and writeSomeBody(). Definition at line 427 of file ModXact.cc. References Adaptation::Icap::VirginBodyAct::active(), Adaptation::Icap::InOut::body_pipe, BodyPipe::buf(), canStartBypass, BodyPipe::consume(), MemBuf::contentSize(), debugs, disableBypass(), Adaptation::Icap::Xaction::disableRepeats(), HERE(), Adaptation::Icap::Xaction::isRepeatable, Adaptation::Icap::Xaction::isRetriable, min(), Must, Adaptation::Icap::VirginBodyAct::offset(), protectGroupBypass, size, MemBuf::spaceSize(), BodyPipe::status(), virgin, virginBodySending, virginBodyWriting, and virginConsumed. Referenced by echoMore(), stopBackup(), stopWriting(), and writeSomeBody(). Definition at line 419 of file ModXact.cc. References Adaptation::Icap::VirginBodyAct::active(), Adaptation::Icap::InOut::body_pipe, BodyPipe::buf(), MemBuf::content(), Must, Adaptation::Icap::VirginBodyAct::offset(), virgin, and virginConsumed. Referenced by echoMore(), and writeSomeBody(). Definition at line 407 of file ModXact.cc. References Adaptation::Icap::VirginBodyAct::active(), Adaptation::Icap::InOut::body_pipe, BodyPipe::buf(), MemBuf::contentSize(), Must, Adaptation::Icap::VirginBodyAct::offset(), virgin, and virginConsumed. Definition at line 389 of file ModXact.cc. References Adaptation::Icap::InOut::cause, Adaptation::Icap::InOut::header, Must, request(), and virgin. Referenced by decideOnPreview(), finalizeLogInfo(), makeRequestHeaders(), maybeAllocateHttpMsg(), parseIcapHead(), start(), and swanSong(). Definition at line 109 of file ModXact.cc. References Adaptation::Icap::ServiceRep::callWhenAvailable(), Adaptation::Icap::ServiceRep::callWhenReady(), canStartBypass, debugs, disableBypass(), Adaptation::Icap::Xaction::disableRepeats(), Adaptation::Icap::Xaction::disableRetries(), HERE(), JobCallback, Must, noteServiceAvailable(), noteServiceReady(), Adaptation::Icap::Xaction::service(), Adaptation::Icap::ModXact::State::serviceWaiting, Adaptation::srvBlock, Adaptation::srvWait, state, Adaptation::Icap::Xaction::status(), TexcHere, and Adaptation::Icap::ModXact::State::waitedForService. Definition at line 239 of file ModXact.cc. References debugs, HERE(), Must, NULL, Adaptation::Icap::ModXact::State::serviceWaiting, state, Adaptation::Icap::Xaction::status(), stopWriting(), TexcHere, writePreviewBody(), writePrimeBody(), Adaptation::Icap::Xaction::writer, Adaptation::Icap::ModXact::State::writing, Adaptation::Icap::ModXact::State::writingAlmostDone, Adaptation::Icap::ModXact::State::writingConnect, Adaptation::Icap::ModXact::State::writingHeaders, Adaptation::Icap::ModXact::State::writingInit, Adaptation::Icap::ModXact::State::writingPaused, Adaptation::Icap::ModXact::State::writingPreview, Adaptation::Icap::ModXact::State::writingPrime, and Adaptation::Icap::ModXact::State::writingReallyDone. Referenced by handle100Continue(), handleCommWroteBody(), handleCommWroteHeaders(), noteBodyProducerAborted(), noteBodyProductionEnded(), and noteMoreBodyDataAvailable(). Definition at line 277 of file ModXact.cc. References Adaptation::Icap::InOut::body_pipe, BodyPipe::buf(), MemBuf::contentSize(), Adaptation::Icap::Preview::debt(), debugs, decideWritingAfterPreview(), Adaptation::Icap::Preview::done(), HERE(), min(), Must, NULL, preview, size, size_t, state, Adaptation::Icap::Xaction::status(), virgin, writeSomeBody(), Adaptation::Icap::ModXact::State::writing, and Adaptation::Icap::ModXact::State::writingPreview. Definition at line 308 of file ModXact.cc. References Adaptation::Icap::VirginBodyAct::active(), Adaptation::Icap::InOut::body_pipe, BodyPipe::buf(), MemBuf::contentSize(), debugs, HERE(), Must, size, size_t, state, stopWriting(), virgin, virginBodyEndReached(), virginBodyWriting, writeSomeBody(), Adaptation::Icap::ModXact::State::writing, and Adaptation::Icap::ModXact::State::writingPrime. Definition at line 322 of file ModXact.cc. References addLastRequestChunk(), MemBuf::append(), Adaptation::Icap::InOut::body_pipe, MemBuf::clean(), closeChunk(), MemBuf::contentSize(), debugs, Adaptation::Icap::Preview::done(), MemBuf::hasContent(), HERE(), MemBuf::init(), min(), Must, NULL, openChunk(), preview, Adaptation::Icap::VirginBodyAct::progress(), Adaptation::Icap::Xaction::scheduleWrite(), state, virgin, virginBodyEndReached(), virginBodyWriting, virginConsume(), virginContentData(), virginContentSize(), Adaptation::Icap::Xaction::writer, Adaptation::Icap::ModXact::State::writing, Adaptation::Icap::ModXact::State::writingAlmostDone, Adaptation::Icap::ModXact::State::writingPreview, and Adaptation::Icap::Preview::wrote(). Referenced by writePreviewBody(), and writePrimeBody(). Definition at line 171 of file ModXact.h. Referenced by echoMore(), finalizeLogInfo(), makeAdaptedBodyPipe(), maybeAllocateHttpMsg(), parseBody(), parseHttpHead(), parseIcapHead(), prepEchoing(), prepPartialBodyEchoing(), readMore(), startReading(), startSending(), and stopSending(). Definition at line 318 of file ModXact.h. Referenced by Adaptation::Icap::Xaction::closeConnection(), Adaptation::Icap::OptXact::finalizeLogInfo(), Adaptation::Icap::Xaction::finalizeLogInfo(), finalizeLogInfo(), Adaptation::Icap::Xaction::noteCommRead(), Adaptation::Icap::Xaction::noteCommWrote(), and Adaptation::Icap::Xaction::setOutcome(). Referenced by finalizeLogInfo(), and Adaptation::Icap::Xaction::maybeLog(). Definition at line 372 of file ModXact.h. Referenced by Adaptation::Icap::Launcher::launchXaction(), and start(). Definition at line 302 of file ModXact.h. Referenced by decideOnParsingBody(), parseBody(), stopParsing(), and ~ModXact(). Definition at line 304 of file ModXact.h. Referenced by callException(), disableBypass(), fillPendingStatus(), start(), virginConsume(), and waitForService(). Referenced by Adaptation::Icap::OptXact::doneReading(), Adaptation::Icap::Xaction::doneReading(), Adaptation::Icap::Xaction::fillDoneStatus(), Adaptation::Icap::Xaction::noteCommRead(), Adaptation::Icap::Xaction::parseHttpMsg(), and parsePart(). Definition at line 322 of file ModXact.h. Referenced by decideOnParsingBody(), and parseBody(). Referenced by Adaptation::Icap::Xaction::finalizeLogInfo(), Adaptation::Icap::OptXact::handleCommRead(), handleCommRead(), and Adaptation::Icap::Xaction::Xaction(). Referenced by Adaptation::Icap::Xaction::finalizeLogInfo(), Adaptation::Icap::OptXact::handleCommConnected(), handleCommConnected(), and Adaptation::Icap::Xaction::Xaction(). Referenced by Adaptation::Icap::Xaction::finalizeLogInfo(), start(), and Adaptation::Icap::Xaction::Xaction(). Referenced by expectIcapTrailers(), Adaptation::Icap::OptXact::finalizeLogInfo(), Adaptation::Icap::Xaction::finalizeLogInfo(), gotEncapsulated(), handle100Continue(), Adaptation::Icap::OptXact::handleCommRead(), ModXact(), parseIcapHead(), Adaptation::Icap::OptXact::parseResponse(), and Adaptation::Icap::Xaction::tellQueryAborted(). Referenced by Adaptation::Icap::Xaction::finalizeLogInfo(), Adaptation::Icap::OptXact::makeRequest(), makeRequestHeaders(), Adaptation::Icap::Xaction::tellQueryAborted(), Adaptation::Icap::Xaction::Xaction(), and Adaptation::Icap::Xaction::~Xaction(). Referenced by Adaptation::Icap::Xaction::noteCommWrote(), and stopWriting(). Referenced by AsyncJob::callEnd(), callException(), AsyncJob::callStart(), AsyncJob::canBeCalled(), AsyncJob::deleteThis(), Log::TcpLogger::endGracefully(), Log::TcpLogger::handleClosure(), and AsyncJob::mustStop(). Referenced by Adaptation::Icap::Xaction::disableRepeats(), Adaptation::Icap::Xaction::repeatable(), and virginConsume(). Referenced by bypassFailure(), callException(), decideOnRetries(), Adaptation::Icap::Xaction::disableRetries(), Adaptation::Icap::Xaction::openConnection(), Adaptation::Icap::Xaction::retriable(), and virginConsume(). Definition at line 300 of file ModXact.h. Referenced by addLastRequestChunk(), decideOnPreview(), decideOnRetries(), decideWritingAfterPreview(), fillDoneStatus(), fillPendingStatus(), finishNullOrEmptyBodyPreview(), handle100Continue(), handle206PartialContent(), handleCommWroteHeaders(), makeAllowHeader(), makeRequestHeaders(), shouldAllow206in(), writePreviewBody(), and writeSomeBody(). Definition at line 305 of file ModXact.h. Referenced by disableBypass(), fillPendingStatus(), and virginConsume(). Referenced by Adaptation::Icap::Xaction::mayReadMore(), Adaptation::Icap::Xaction::noteCommRead(), parseBody(), Adaptation::Icap::Xaction::parseHttpMsg(), parseMore(), parsePart(), Adaptation::Icap::OptXact::parseResponse(), readMore(), Adaptation::Icap::Xaction::scheduleRead(), stopParsing(), and Adaptation::Icap::Xaction::swanSong(). Referenced by Adaptation::Icap::Xaction::cancelRead(), Adaptation::Icap::Xaction::closeConnection(), Adaptation::Icap::Xaction::doneAll(), Adaptation::Icap::Xaction::doneWithIo(), Adaptation::Icap::Xaction::fillPendingStatus(), Adaptation::Icap::Xaction::noteCommRead(), readMore(), Adaptation::Icap::Xaction::scheduleRead(), startReading(), and Adaptation::Icap::Xaction::updateTimeout(). Definition at line 316 of file ModXact.h. Referenced by decideOnParsingBody(), finalizeLogInfo(), and parseBody(). Definition at line 311 of file ModXact.h. Referenced by finalizeLogInfo(), and parseHttpHead(). Referenced by bypassFailure(), Adaptation::Icap::Xaction::closeConnection(), Adaptation::Icap::Xaction::handleCommTimedout(), Adaptation::Icap::Xaction::noteCommRead(), parseIcapHead(), Adaptation::Icap::OptXact::parseResponse(), and stopWriting(). Referenced by addLastRequestChunk(), checkConsuming(), decideOnParsingBody(), decideWritingAfterPreview(), doneAll(), doneSending(), echoMore(), fillDoneStatus(), fillPendingStatus(), handle100Continue(), handle200Ok(), handle206PartialContent(), handleCommConnected(), handleCommRead(), handleCommWrote(), handleCommWroteHeaders(), makeAllowHeader(), noteBodyProducerAborted(), noteBodyProductionEnded(), noteMoreBodyDataAvailable(), noteMoreBodySpaceAvailable(), noteServiceAvailable(), noteServiceReady(), parseBody(), parseHeaders(), parseIcapHead(), parseMore(), parsePart(), prepEchoing(), prepPartialBodyEchoing(), startSending(), startWriting(), stopParsing(), stopSending(), stopWriting(), waitForService(), writeMore(), writePreviewBody(), writePrimeBody(), and writeSomeBody(). Referenced by Adaptation::Initiate::clearInitiator(), Adaptation::Icap::Launcher::doneAll(), Adaptation::Initiate::initiator(), Adaptation::Icap::Xaction::noteInitiatorAborted(), Adaptation::Initiate::sendAnswer(), Adaptation::Icap::Launcher::start(), Adaptation::Initiate::swanSong(), Adaptation::Iterator::swanSong(), Adaptation::Icap::Launcher::swanSong(), swanSong(), and Adaptation::Icap::Xaction::tellQueryAborted(). Definition at line 320 of file ModXact.h. Referenced by decideOnParsingBody(), parseBody(), parseIcapHead(), parseIcapTrailer(), stopParsing(), and ~ModXact(). Definition at line 170 of file ModXact.h. Referenced by checkConsuming(), echoMore(), estimateVirginBody(), fillDoneStatus(), fillPendingStatus(), finalizeLogInfo(), finishNullOrEmptyBodyPreview(), makeRequestHeaders(), ModXact(), noteBodyProducerAborted(), noteBodyProductionEnded(), parseHttpHead(), prepEchoing(), prepPartialBodyEchoing(), virginBodyEndReached(), virginConsume(), virginContentData(), virginContentSize(), virginRequest(), writePreviewBody(), writePrimeBody(), and writeSomeBody(). Definition at line 296 of file ModXact.h. Referenced by canBackupEverything(), decideOnPreview(), estimateVirginBody(), handleCommWroteHeaders(), makeAllowHeader(), makeRequestHeaders(), and shouldAllow206any(). Definition at line 298 of file ModXact.h. Referenced by echoMore(), fillPendingStatus(), makeAllowHeader(), prepEchoing(), prepPartialBodyEchoing(), stopBackup(), stopSending(), and virginConsume(). Definition at line 297 of file ModXact.h. Referenced by estimateVirginBody(), finishNullOrEmptyBodyPreview(), stopWriting(), virginConsume(), writePrimeBody(), and writeSomeBody(). Definition at line 299 of file ModXact.h. Referenced by prepPartialBodyEchoing(), virginConsume(), virginContentData(), and virginContentSize(). Referenced by Adaptation::Icap::Xaction::closeConnection(), Adaptation::Icap::Xaction::doneAll(), Adaptation::Icap::Xaction::doneWithIo(), Adaptation::Icap::Xaction::doneWriting(), Adaptation::Icap::Xaction::fillPendingStatus(), Adaptation::Icap::Xaction::noteCommWrote(), Adaptation::Icap::Xaction::scheduleWrite(), stopWriting(), Adaptation::Icap::Xaction::updateTimeout(), writeMore(), and writeSomeBody().